Penny wise and pound foolish – an idiom of long ago, but more relevant today than we’d like to admit. It even applies to cabling, of all things. 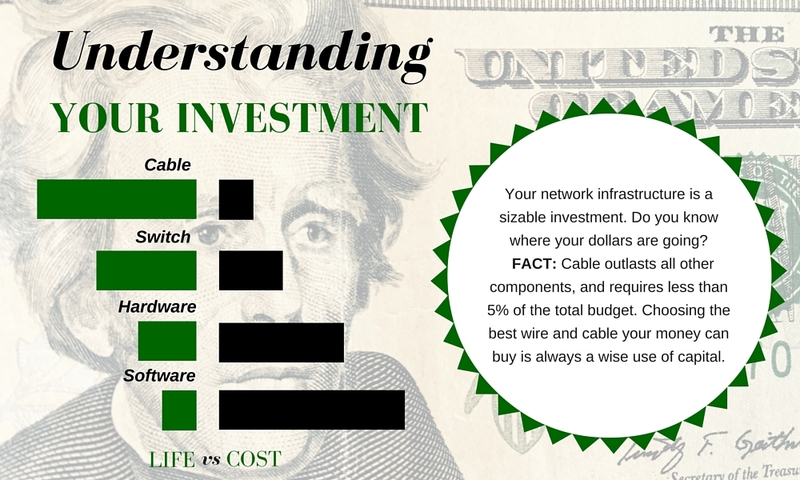 Many folks look at cabling as an expense and therefore shop ‘til they drop for that low, low price. They “save” on some material, install it, and think they’re lucky when everything seems to work… but then stress meets the system via a large file or a streamed a video. Suddenly, what should’ve taken milliseconds is taking tens of seconds and it’s clipping. Multiply that by the number of peers on your network, and the 251 business days each year, and then multiply that result by 20 (common warranty period). The result? A bargain-priced costly mistake. In this day and age, consumers can literally shop the world for what they need – including wire, cable, and network components. It’s not uncommon to find these types of bargains from overseas vendors, but those lower costs come with a hefty price. Foreign countries don’t offer or enforce regulations, which many times translates to subpar products, or goods that are made to look like something they are not (copper clad aluminum wire is a great example). “The strengths of America’s international standing continue to be innovation, opportunities, and vibrancy,” Anholt* said in a press release. Germany placed second and the U.K. third. China didn’t crack the top 10. If I have one piece of advice to offer anyone looking to cross off items on the company infrastructure shopping list, it’s this: Buy the best you can afford, and you’ll never be disappointed. That means doing your homework. Know the product. Know the vendor. Know expectations for longevity and performance. Know your financial commitment – both now, and into the future. No doubt, that’s a lot of Knows… but the information you gain today will give you a much deeper understanding, and a good chance of investing in a true value. Think you know how system dollars are spent? Check out our infographic… you just might be surprised. * Simon Anholt is a British branding consultant and the originator of the Anholt-GfK Roper Nation Brands Index, a tool that measures a nation’s international reputation.